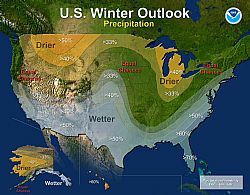 Forecasters at NOAA’s Climate Prediction Center issued the U.S. Winter Outlook today favoring cooler and wetter weather in Southern Tier states with above-average temperatures most likely in the West and across the Northern Tier. This year’s El Niño, among the strongest on record, is expected to influence weather and climate patterns this winter by impacting the position of the Pacific jet stream. Other factors that often play a role in the winter weather include the Arctic Oscillation, which influences the number of arctic air masses that penetrate into the South and nor'easters on the East Coast, and the Madden-Julian Oscillation, which can impact the number of heavy rain storms in the Pacific Northwest.